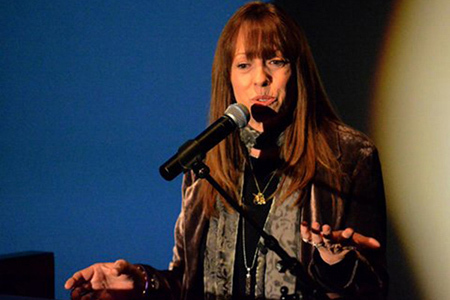 Mackenzie Phillips, Ed Begley, Jr., and comedian, Alonzo Bodden were among the Stars who honored Carrie White as the author received the Experience, Strength And Hope Award from Writers In Treatment on Thursday, February 13, 2014 at the Skirball Cultural Center in Los Angeles. During this festive evening, co-sponsored by Writers In Treatment, tributes honored White for her courageous and honest memoir about her journey from addiction to recovery. Carrie White, author of the critically-acclaimed book Upper Cut, was honored with Writers In Treatment’s Experience, Strength and Hope Award on Thursday night during a celebratory event co-sponsored by Writers In Treatment. Host Ed Begley, Jr., headline performer Alonzo Bodden, actress Mackenzie Phillips and performer John Fuchs also paid tribute to White during the starry event held at the Skirball Cultural Center in Los Angeles.